Dakar Rally TICKER: French Axel Dutrie the provisional winner in the Quads! The Yamaha pilot could manage the stage in 06:59:04, 4:50 minutes in front of Marcelo Medeiros from Brazil and 8:58 of Ignacio Casale from Chile. The top five are completed by Sanabria Galeano (+11:33) and Giuliano Horacio Giordana from Argentina (+19:38). Dakar Rally TICKER: The last stage for today´s winner Joan Barreda Bort of the Monster Energy Honda Team? 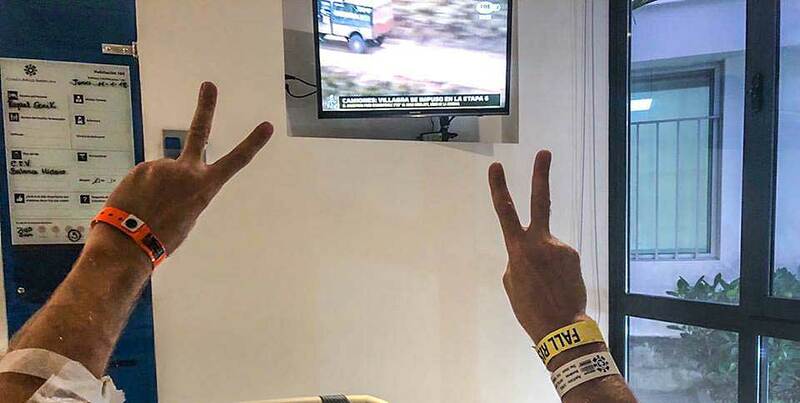 As the organizer reported, the stagewinner and 3rd overall today maybe broke his knee during the stage but could finish it... "I´m not sure, my knee is feeling instable and I can´t really walk," the Spaniard said. Dakar Rally TICKER: Giniel de Villiers reported from the finish line: "Very demanding day today, more demanding than expected. 70 kilometers of camel gras. Phew. And even the rest was very bumpy & a pure buggy road. Giniel drove superbly, Hilux is in top shape and form. This is far from over. Anything is still possible!" Dakar Rally TICKER: After the first trucks passed WP4, Dutchman Ton van Genugten with his De Rooy Iveco is the new leader in SS07 - with only 6 seconds in front of the Kamaz of Mardeev and 44 seconds before the second De Rooy Iveco of the Argentinian Federico Villagra. They are followed by the Czech Martin Kolomy (Tatra, +1:54) and his compatriot Martin Macik (Liaz, +2:32). Dakar Rally TICKER: Trucks reached first waypoint: At WP01 Czech Martin Macik is leading the field with his Liaz, 10 seconds in front of the first Kamaz of Sotnikov, 12 seconds before the Iveco of Federico Villagra and the Kamaz of Mardeev, followed 22 seconds by the third Kamaz of Nikolaev. Dakar Rally TICKER: Fastest bikes finished today´s SS07: Provisionally first is Spaniard Joan Barreda (Honda) with 05:11:10, followed by Adrien van Beveren (France, Yamaha, +2:51), Kevin Benavides (Argentina, Honda, +8:02), Toby Price (Australia, KTM, +8:43) and Pablo Quintanilla (Chile, Husqvarna, +8:53). Dakar Rally TICKER: The first cars passed WP4 and overall leader Stéphane Peterhansel had to stop at KM186 in WP3 and is repairing his Peugeot (shock absorbers and suspension triangle broken), loosing lot of time. Actual leader after WP4 is Carlos Sainz (Peugeot), followed by Giniel de Viliers (Toyota, +5:45), Jakub Przygonski (Mini 4x4, +11:13), Nasser Al Attiyah (Toyota, +13:34) and Martin Prokop (Ford Ranger, +14:28). Dakar Rally TICKER: All cars and SxS are in the stage now and we are waiting for the trucks. The first bikes passed WP5 now and Honda-pilot Joan Barreda has strenghten his lead to 5:21 minutes to Adrien van Beveren (Yamaha). Actual third is Stefan Svitko (KTM, +10:52) in front of Pablo Quintanilla (Husqvarna, +11:25) and Kevin Benavides (Honda, +11:39). 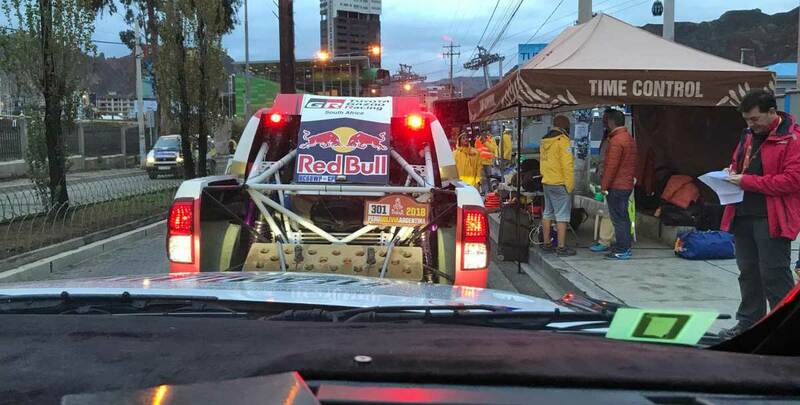 Dakar Rally TICKER: The first cars have reached the first WP. Qatari Nasser Al Attiyah is leading slightly with 16 seconds in front of the first Peugeot of Carlos Sainz, followed by Stéphane Peterhansel (+18 sec), Giniel de Villiers (Toyota, +28 sec) and Mikko Hirvonen in the X-raid Mini Buggy (+1:00 mins). Dakar Rally TICKER: The first bikes passed WP4. Spaniard Joan Barreda is still leading the field with now 3:04 minutes gap to Adrien van Beveren (France, Yamaha), Stefan Svitko (KTM, +8:23), Pablo Quintanilla (Husqvarna, +9:07) and Kevin Benavides (Argentina, Honda, +9:51). The stage is very fast in WRC-style, partly muddy and partly dry. Dakar Rally TICKER: In the quads, Nelson Augusto Sanabria Galeano from Paraguay is the actual leader with his Yamaha after WP01, followed by the Chilenian Ignacio Casale (+42 sec), Alain Dutrie from France (+45 sec), Pablo Copetti from Argentina (+1:20) and the Pole Kamil Wisniewski with his Can-Am (+1:40). Dakar Rally TICKER: The first bikes reached WP2 and we can see a highly motivated local: Daniel Nosiglia Jager from Bolivia is pushing his KTM hard and id third now with 2:34 minutes to the leader Joan Barreda from Spain (Honda). Second is Adrien van Beveren (Yamaha, +1:34). The top five are completed with Matthias Walkner (KTM, +3:09) and Xavier de Soultrait (Yamaha, +3:39). The stage is part 1 of two marathon-stages, so service from the mechanics after the stage is not allowed. Today the bike will start first at 08:15 local time (13:15 CET), followed by the Quads at 09:29 local time (14:29 CET), Cars at 10:58 (15:58 CET), Side-by-Side 11:58 (16:58 CET) and Trucks 13:26 (18:26 CET). Bikes and Cars will drive 727 km liaison, 425 km stage, so 1152 km overall - the trucks have 671 km liaison, 369 km stage so 1040 km overall.